Are you a creative woman entrepreneur who needs to make more money? You started your business because you are naturally creative and you were called to share that with others to help them. You have an innate creative talent. I get it, because I am the same way. But, like many creative entrepreneurs you jumped in and thought that your talent would make your business succeed. You thought your creativity would translate into all the skills you need to market, get clients, sell, and make profits. I get that part too, because I was that person. Now you’re stuck and you can’t figure out how to get paying clients and MAKE A PROFIT. On top of that you aren’t feeling the joy of sharing your unique talent with others. You are in this business because you want freedom. Freedom from a day job, freedom from having a boss, freedom to work remotely. You want to feel like you are truly contributing to supporting your family and that it doesn’t just fall on your partner’s shoulders. You hope that someday your partner could quit the job they are stuck in. You want to make enough that people think of you as a business woman, not just a hobbyist. That is a frustrating place to be and I’ve been there too. 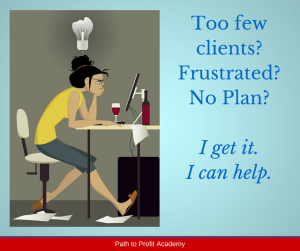 I created the Path to Profit Academy because I am passionate about helping creative entrepreneurs like yourself get the right plan in place to MAKE MONEY. Want to do a quick audit of where your business stands and see what’s missing? This is a great place for you to start!